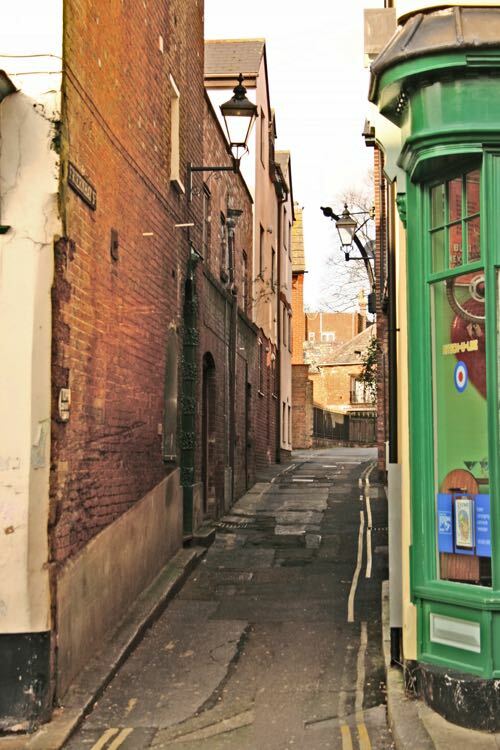 The narrow Friernhay Street passing the front of St Nicholas Priory, and joining Fore Street and Bartholomew Street West led to an area that was settled in 1226, by eight 'Greyfriars' monks, from Oxford. They had been invited to found a Franciscan Friary, in what is now the old All Hallows Churchyard, above the Catacombs. It became known as Friernhay with 'Hay' meaning enclosed land. Around about 1300, the Greyfriars were given permission by Edward I to relocate to a site outside the city wall, close to South Gate. 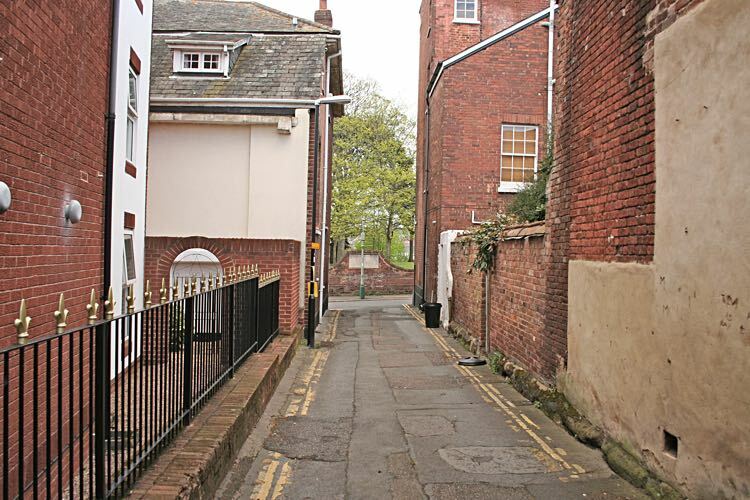 This area, above the river, also became known as Friernhay and is now occupied by Colleton Crescent. The vacated site was used as a rackfield for drying woollen serge, and from 1669, as the site of the weekly horse market. When the St Peter's Churchyard (Cathedral) became full with burials after hundreds of years of use, the City Chamber provided the rackfield of Friernhay for a new cemetery. It was opened on St Bartholomew's Day, 1637. The cemetery saw its last burial at the 1832 cholera outbreak before it was closed. In 1843, All-Hallows-on-the-Wall Church was built to a design by John Hayward in the cemetery. It was deconsecrated in 1943 and demolished in 1950. James Cossins remembered the cattle market in the area in 1824 "The Cattle Market which was more numerously attended, and the stock a greater number than now, was held in Bartholomew street. 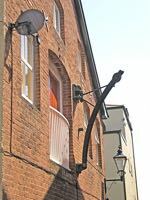 I have seen the cattle from the comer of North street to Friernhay street." 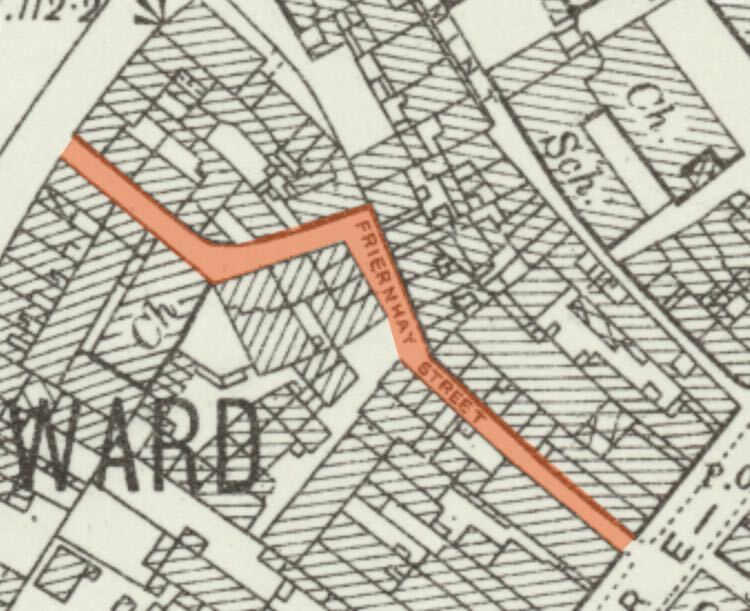 The entrance to Friernhay Street was flanked, in 1873, by Godfrey, the spirit merchant and the King Alfred Inn; where ever there was poverty, there was a ready source of alcohol, and Friernhay Street was no exception. In 1854, the Society of the Relief of the Sober and Industrious Poor arranged to deliver coal every Saturday between 8 and 11 am. They operated a system whereby subscribers were issued with tickets that entitled them to 20lbs (9 kilos) of coal for 1d. During the cholera outbreak of 1832, thirteen inhabitants from the street died, including two from a nearby court. Although it was water from dipping the leats that was contaminated with the cholera bacteria, local wells were becoming polluted, and in December 1877, the Sanitary Committee considered a report that the water from a well in the street was unwholesome. A sample was analysed and it was found to be unfit for use; the well was closed and filled. An interesting incident between a posse of eight policemen and a Salvation Army band occurred in the street in 1884. Complaints had been received by the police from residents of the street, regarding the noise the Salvationists made when passing in procession up the street. Eight policemen were stationed at the entrance to the street–when the Salvationists arrived from their open-air service, a serious mélee took place between them. 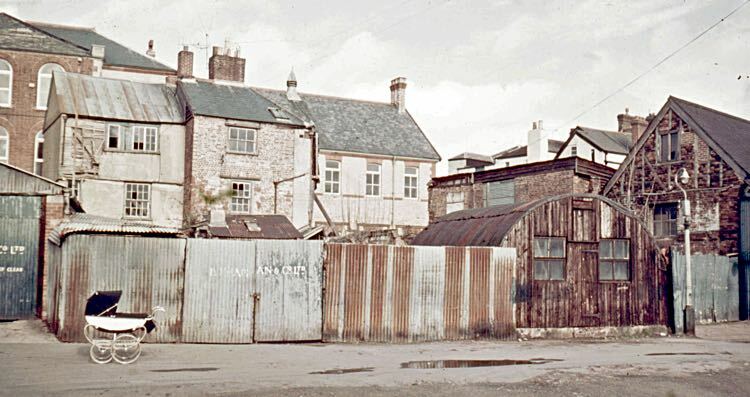 The Salvationist Captain claimed that although they had ceased playing their instruments, they were still prevented from passing up the street to the Salvation Army Fort, by the police. They attempted to push their way through in single-file, but the police held the line. The police claimed they were noisy and therefore would not let them pass. Two or three hundred Salvationists and their friends then forced their way up Friernhay Street, and two or three police officers were struck in the face and kicked in the lags–no arrests were made. This was not an isolated incident, and tension between resident, police and the Salvation Army would often flare into a confrontation. In November 1891, a severe gale damaged much of Exeter. A chimney was blown over and crashed through a roof of a house in the street, causing damage estimated at £20 to Mr Henry Powell's property. AJW Motorcycles manufactured motorcycles in Friernhay Street. Arthur John Wheaton, of the printers, started the company in 1926 from workshops adjacent to the print works. In May 1939, before the outbreak of war, public lectures were given at the A.R.P. Training Centre in Friernhay Street. Two lectures covered respectively, 'A.R.P. in the Home' and 'The Relationship of Air Raid Wardens' Service to A.R.P. in Business Premises'. 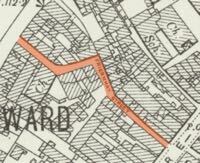 Sources: Trewman's Exeter Flying Post, Alan H Mazonowicz, James Cossins and Two Thousand Years in Exeter by W G Hoskins..
Map showing location of Exe Central Friernhay Street in 1972. Photo Alan H Mazonowicz. Looking into Friernhay Street from Fore Street. Looking along Friernhay Street towards Bartholomew Street. 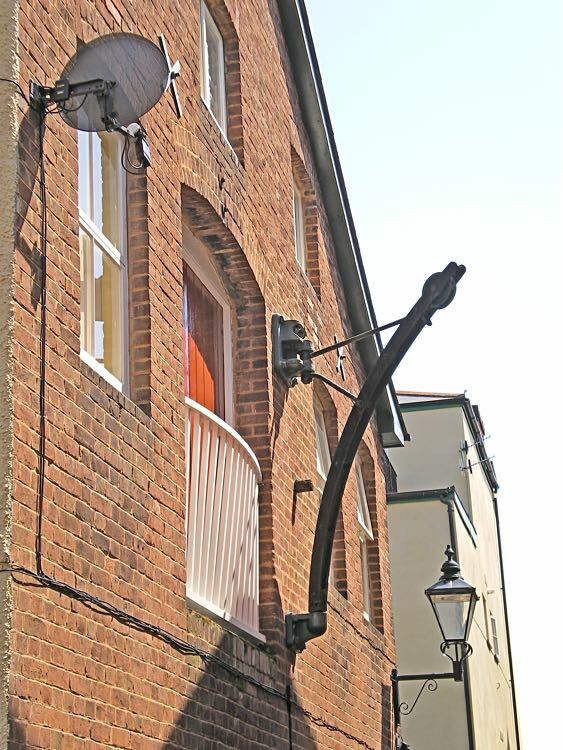 An original hoist, from when there were warehouses in the street.